LOS ANGELES — The Ottawa Senators were facing a third-period deficit against one of the best finishing teams in the NHL riding high since the Christmas break. 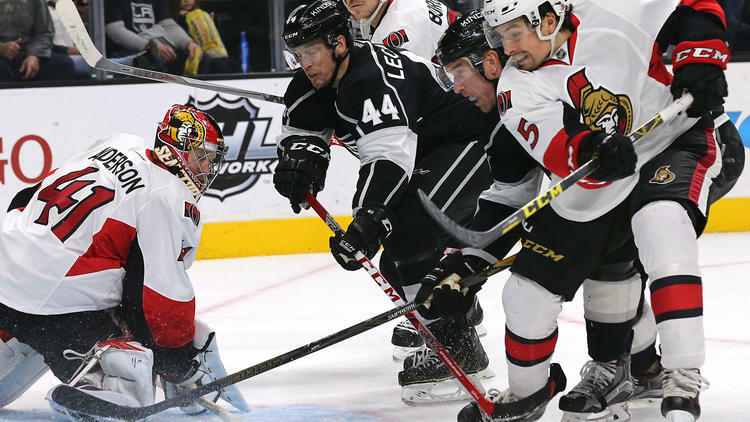 Mika Zibanejad scored on the power play with 6:50 remaining and the Senators rallied from a two-goal deficit with four goals in the third period for a 5-3 win against the Los Angeles Kings at Staples Center on Saturday. “We were desperate for a win and we found a way to get it done,” said Ottawa goalie Craig Anderson, who made 30 saves for his 200th NHL win. Zibanejad’s game-winner capped a comeback from down 3-1 early in the third period. He took a pass from Bobby Ryan on the left side and scored on a wrist shot during a double-minor penalty to Nick Shore for high sticking. The Senators (21-18-6) won for the third time in 14 road games after they were outscored 11-2 in the first two games of a five-game trip. The Kings (27-13-3) had their second regulation loss since the Christmas break, and it was uncharacteristic. Los Angeles led 3-1 on Tyler Toffoli’s goal 3:05 into the third before Ottawa rallied with goals by Ryan and Jean-Gabriel Pageau in 26 seconds to tie the game, 3-3. Toffoli tapped in Milan Lucic’s pass from the corner to finish a rush for his Kings-leading 21st goal. The Kings were 17-2-0 when leading after two periods. The loss broke a 7-1-1 run since the Christmas break and coach Darryl Sutter said he’s seen some cracks. Ryan put Zibanejad’s cross-ice pass into an open net at 8:08. Pageau whacked at the puck on the stick of Kings defenseman Jake Muzzin and it shot past goalie Jonathan Quick at 8:34 to tie the game 3-3. Jeff Carter scored in the first period, and Vincent Lecavalier scored his first goal with the Kings when he grabbed a loose puck on the power play and lifted a shot at 7:48 of the second for a 2-0 lead. Defenseman Christian Ehrhoff made a blind pass across the slot and it slid over to Lecavalier, who was traded to the Kings by the Philadelphia Flyers on Jan. 6. Ottawa pulled to 2-1 in the second on Alex Chiasson’s first goal in 26 games. The Kings couldn’t control a long stretch pass, and Chiasson tapped in Curtis Lazar’s rebound at 11:37. Chiasson was scratched the previous four games. Mark Borowiecki scored an empty-net goal to make it 5-3 with 14 seconds remaining. Anderson stopped Toffoli on a penalty shot attempt late in the second period after Toffoli was bear hugged by Erik Karlsson on a breakaway. Anderson said he wasn’t aware of his 200th win until after the game.